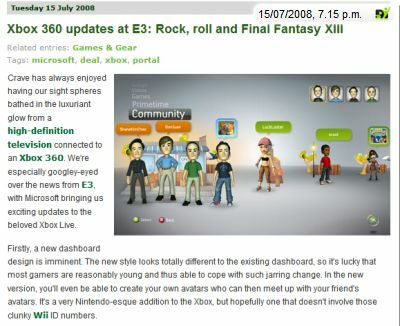 Weblin Blog: Xbox 360 comes with avatars! As Microsoft announced at E3 in LA, the Xbox 360 comes with exciting updates: "In the new version, you'll even be able to create your own avatars who can then meet up with your friend's avatars." This is again great news, because it emphasises the global trend to virtual identity, avatars and socializing.